If you’re building a new home, or your current driveway needs a bit of a facelift, you need to know about concrete slate. If you’re investigating possible options, you’re probably thinking about tile, stone or even other concrete options, such as stencil, aggregate and painted, but, concrete slate is becoming an incredibly popular choice. Find out why below. So, What Is Slate Concrete? Pool surrounds: Having a non-slip surface around your pool is essential in creating a safe environment for your family and guests to play. Slate concrete is the perfect choice, due to its anti-slip properties, and will look beautiful next to a pool. Choose warmer colours in order to contrast with the blue of your pool, or go darker for a more elegant, restrained feel. Patios: Patios are subject to a lot of traffic. Furniture is continuously moved around and food gets spilt. Not only is slate concrete durable enough to handle furniture, but it naturally hides any spills. Courtyards: Don’t worry about your paving being spoilt by leaking flower pots or the weather. Enjoy a beautiful courtyard forever thanks to the low-maintenance toughness of slate concrete. Paths: Any garden is enhanced by the use of paths. Paths make it easier to move through a garden and keep your house clean by containing dirt and debris to its rightful place. Paved or tiled paths can be surprisingly expensive and labour intensive, the choice of slate concrete offers an economical solution. 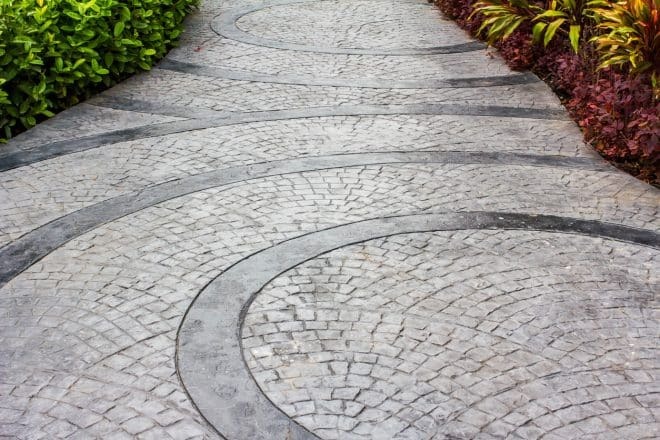 As the name infers, slate concrete is made from concrete, which makes it incredibly durable. The durability of slate concrete makes it an excellent choice for driveways, which are subject to a considerable amount of heavy traffic. How Does The Imprinting Process Work? After concrete has been poured, and is still wet, a mat is laid over the concrete slab. The mat is patterned to replicate the look of slate and the pressure of the mat creates beautiful texturing. After the concrete has set, it is washed with a pressure cleaner and sealed. The sealant protects the driveway against the elements and lasts for up to five years. Concrete is used all around the world, in the construction industry, because it is incredibly strong. The mix of sand, gravel, cement and water provides an incredibly durable surface that will withstand the repeated crunch of your car’s tyres for years. The stamping of the concrete doesn’t affect its durability, so the final product not only has the beauty of slate, but also the toughness of concrete. Do you love your weekend? Choose slate concrete. With slate concrete there’s no need to replace cracked tiles, regrout, weed in between cracks or do any maintenance at all. In fact, all you have to do is give it a sweep and a hose down every now and then, and it will look good for years. Seal it every 5-10 years, and it may just last forever. If you want to accurately mimic slate, the obvious choice is dark colours. But, if you want to reimagine the look, there’s a whole range of colours from which to choose. You could select something warmer or earthier, or just a palette that suits your home. It doesn’t matter what colour you select, what matters is that you have the choice. Slate is a beautiful material, but it’s also expensive. Not only is the raw material costly, but the labour required to lay slate is also expensive. Concrete is a far cheaper material, and is quicker to pour and lay, so you also save on labour. Concrete starts its life in liquid form. This means it can be moulded to any shape or type of space. You can even pour concrete in a circle. There’s a reason why slate is so popular – it looks beautiful. Slate is suitable for all types of design schemes and is sleek and sophisticated, yet warm enough to be homely. It is also minimalist enough to suit the modern aesthetic. Slate concrete is the perfect alternative, so you really can’t go wrong. If you want to learn more about slate concrete, get in touch with our friendly concreters. Our concreters love what they do. So, they love nothing more than discussing the merits of one of their favourite materials. Our concreters even offer the service of a free, no obligation quote to enable you to have a clear idea of how much the project will cost before you give the go ahead. We think you’ll get a pleasant surprise when you see the final price.